Off of Boneyard Highway (don’t ask), grows a fairly large stand of low bush blueberries. Low bush blueberries grow on bushes that are about a foot and a half tall. The berries ripen in late July and August. They grow in clusters of several berries, at the end of the branches. This weekend, we picked wild low bush blueberries. Actually the me part of we took a nap instead and was not, technically, in attendance at the Boneyard Highway blueberry pick. My job came later. Steve, Dan, Mel and Roxie the Chocolate Lab set out armed with info to be sure they didn’t end up picking something deadly like nightshade berries. Mindful to watch for poison ivy and bear (neither were spotted), they picked about three pints of low bush blueberries. The fruit of low bush berries are smaller, with a somewhat deeper blue skin color than the high bush berries typically sold in supermarkets. The inside of the low bush berry is more like the Crayola color “red violet” than blue. The two kinds of blueberries don’t taste the same. High bush blueberries taste sort of like lima beans without the pretty green color. It must be all those antioxidants. To my mouth they are a waste of chewing. But these wild blueberries are nothing like lima beans. They have a definite good taste. Tart. Interesting. You know they’re in your mouth, but not because you want to spit them out. Once home, Mel and I picked through the berries and got rid of the rest of the stems and checked for any tag-along little critters. Then came my job. Half the blueberries in a saucepan with about two tablespoons of water and half a cup of sugar. Bring to a boil, and then let the mixture simmer for about ten minutes–longer than you would with their high bush cousins. Add the 2 tablespoons of cornstarch and two tablespoons of water you whisked together before you put the blueberries on the burner. Add one tablespoon of lemon juice. Stir constantly, for about a minute while the mixture thickens. Fold in the rest of the blueberries. Pour the filling into whatever crust you’re using. Let it sit for about an hour before you put it in the fridge. We served our most natural dessert slathered up with that most unnatural topping, Cool Whip, the invention of Kraft chemist William A. Mitchell. Truly better eating through chemistry. For those reading my blog for a slice of Pure Michigan instead of pie, Michigan is the #1 state for production of highbush blueberries. We have more than 18,000 acres in blueberry production. 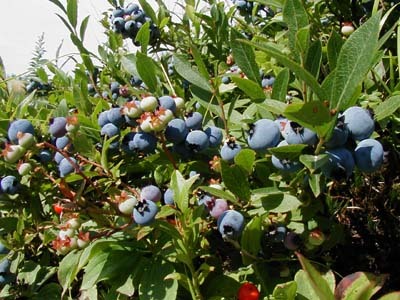 If you click here, you can get a bushel and a peck of Michigan blueberry facts and even meet the MSU Small Fruit Team. If you are really into blueberries, you can attend The National Blueberry Exposition in October in Grand Rapids, Michigan. And, at this very minute, the 47th Annual National Blueberry Festival is happening in South Haven, Michigan. Here is my pie. They don’t happen often in my kitchen. 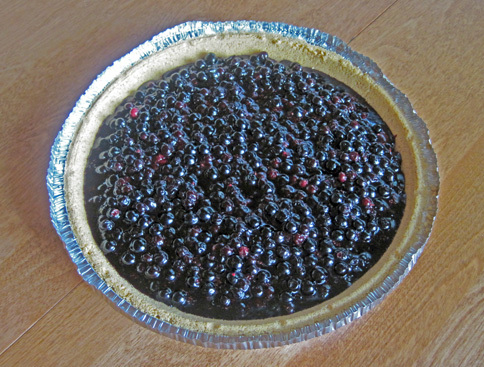 This entry was posted in Long Lake activities, Long Lake Flora and tagged blueberries, Cool Whip by Noreen. Bookmark the permalink.